As discussed in the previous article, Illinois farm fields may be losing an estimated 390 million pounds of nitrogen per year (farmdoc daily, February 25, 2016). The issue has put a very intense focus on subsurface tile drainage. This article looks at both the impact of tile on nutrient loss along with the history and importance of tile drainage to farming. Starting with the basics: nitrogen is vital for various functions that sustain life; plants generally consume nitrogen in the inorganic forms ammonium and nitrate; nitrification is the process by which bacteria convert ammonium to nitrite and then nitrate; and nitrogen in the ammonium form is generally not lost through leaching but nitrogen in the nitrate form is very susceptible to leaching (Kladivko et al., 2004; Royer et al., 2006; Fernandez et al. ; Cameron et al., 2013; Culman and LaBarge 2015). Therefore, nitrate loss depends on the movement of water through the soil; it is “primarily a hydrological process driven by precipitation and drainage of the agricultural landscape” (Royer et al., 2006). The better, more efficient the drainage the better and more efficient the export of nutrients from those soils (Cameron et al., 2013). Other similar features that improve water movement through soil, such as freezing and thawing cycles and large pores known as macropores, will impact nitrate export. Nutrient loss is a function of weather. The more rain and the closer that the rain occurs to nutrient application, the more nitrate exported (Kladivko et al., 2004; David et al., 1997). Precipitation has the largest influence on nitrate leaching, especially in late spring/early summer before growing crops can consume it (Culman and LaBarge, 2015; David et al., 1997). One study found that nearly 80 percent of the annual watershed nitrate load took place from November through April, with the greatest losses in tile-drained fields following years with poor corn crops (Kladivko et al., 2004). A dry growing season will reduce corn yields which reduces nitrogen uptake, leaving behind high inorganic nitrogen in the soil to leach into the tile; it still depends, however, on site-specific conditions such as precipitation (Gentry et al, 1998). Finally, leaching also depends on how much nitrate is present in the soil when it rains (Cameron et al., 2013). The best predictor of leaching, therefore, is the amount of nitrogen surplus in the soil (difference between the sum of the inputs of plant available nitrogen and the nitrogen removed in the harvested crop) rather than simply the amount of nitrogen applied (Cameron et al., 2013). It is not, however, only applied fertilizer that is producing nitrate losses but also “the combination of the most productive soils (high in organic matter) that are tile drained and heavily cropped” (David et al., 2010). Abundant spring rains on fertile, tile-drained soils that grow corn fertilized by nitrogen experience large nitrate losses (David et al., 2015; David et al., 2010; Logan et al., 1994). The following three maps of Illinois help visualize the issue. 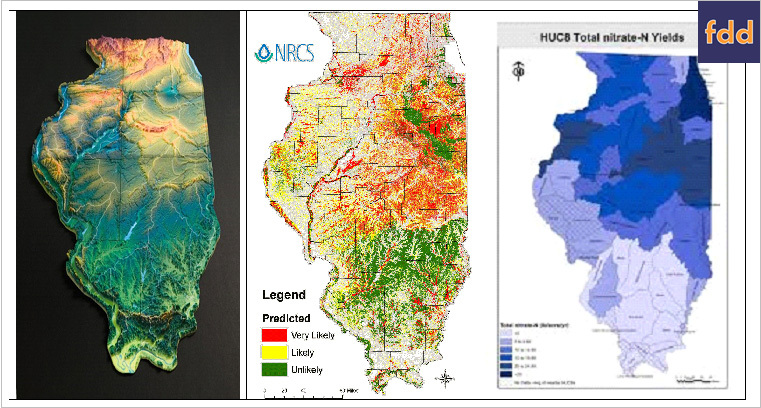 The first map is from the Illinois Water Survey (3D topography of Illinois), the second is from NRCS (estimated tile drainage) and the third is from the INLRS (N-yields from different hydrological unit code (HUC) watersheds; darker colors indicate higher nitrate-N loss). That tile-drained, fertile soils are the source of significant nitrate exports is only part of the story; tile drainage to create those fertile soils has a long history (see, Policy Matters, September 30, 2015). In Illinois, the tile-drained regions of the state were malarial swamps until the 1850s and malaria was the biggest cause of death at that time (Urban, 2005). Beginning in the 1850s, construction of the Illinois Central Railroad helped push settlement and the draining of the disease-spreading swamps (Urban, 2005). Federal and State legislation also played a substantial role, beginning with the Federal Swamp Lands Act that donated lands to states to improve sanitation and convert the land to farmland (Urban, 2005). In 1870, Illinois passed the Farm Drainage Act to provide for the legal organization of drainage districts with the power to assess landowners whose land would benefit from drainage, as well as eminent domain authority to force uncooperative landowners into the district (Uchtmann and Gehris, 1997). Federal farm policy also played a role. USDA was cost-sharing subsurface drainage of wetlands until 1956, and provided technical assistance through 1972 and financial incentives through 1977 (McCorvie and Lant, 1993). Demand for fertile farmland, increased access to transportation, and Federal and State legislation were powerful drivers for turning swampland into farmland and settlements; over 95 percent of the wetland acreage in the Corn Belt was converted between 1850 and 1930 (McCorvie and Lant, 1993). The science behind today’s understanding about the value of wetlands came long after. (McCorvie and Lant, 1993). This history, however, serves as a reminder that we have inherited significant aspects of the nutrient loss problem and cannot expect a quick, simple solution. Moreover, these fields are now some of the most highly productive farmland in the world, crucial to providing for the demands of a growing and hungry population. For example, the areas in the INLRS map above with the higher levels of nitrate-N loss encompass all or part of roughly 30 counties running through the center of the State. According to NASS, these 30 counties harvested 4,774,300 acres and 851,388,000 bushels of corn in 2015. To put this in perspective, that accounted for roughly 6 percent of the national and over 40 percent of the Illinois harvest in 2015; it would make up roughly 45 percent of the total corn exported by the U.S. By comparison, the entire state of Indiana harvested 5,480,000 acres of corn and produced an estimated 822,000,000 bushels in 2015. Without tile, this level of production simply would not be possible; its loss would have severe implications. The potential impacts on production therefore counsel care and caution in the efforts to address nutrient loss. E.J. Kladivko, J.R. Frankenberger, D.B. Jaynes, D.W. Meek, B.J. Jenkinson and N.R. Fausey, "Nitrate leaching to Subsurface Drains as Affected by Drain Spacing and Changes in Crop Production System," J. Environ. Qual., 33:1803-1813 (2004). Fabian Fernandez, Stephen Ebelhar, Emerson Nafziger and Robert Hoeft, "Managing Nitrogen," in the Illinois Agronomy Handbook, chap. 9, pp. 113-132 (University of Illinois Extension) (available: http://extension.cropsciences.illinois.edu/handbook/). K.C. Cameron, H.J. Di, and J.L. Moir, "Nitrogen losses from the soil/plant system: a review," Annals of Applied Biology, 162: 145-173 (2013). Lowell E. Gentry, Mark B. David, Karen M. Smith, David A. Kovacic, "Nitrogen cycling and tile drainage nitrate loss in corn/soybean watershed," Agriculture, Ecosystems and Environment, 68:85-97 (1998). Mark B. David, Laurie E. Drinkwater, Gregory F. McIsaac, "Sources of Nitrate Yields in the Mississippi River Basin," J. Environ. Qual., 39:1657-1667 (2010). Mark B. David, Lowell E. Gentry, David A. Kovacic, and Karen M. Smith, "Nitrogen Balance in and Export from an Agricultural Watershed," J. Environ. Qual., 26:1038-1048 (1997). Mark David, Gregory McIsaac, Gary Schnitkey, George Czapar and Corey Mitchell, "Science Assessment," in Illinois Nutrient Loss Reduction Strategy (2015), Chapter 3 (available: http://www.epa.illinois.gov/Assets/iepa/water-quality/watershed-management/nlrs/nlrs-final-revised-083115.pdf). Mary R. McCorvie and Christopher L. Lant, "Drainage District Formation and the Loss of Midwestern Wetlands, 1850-1930," Agricultural History, 67:4 (1993), pp. 13-39. Michael A. Urban, "An uninhabited waste: transforming the Grand Prairie in nineteenth century, Illinois, USA," Journal of Historical Geography 31 (2005), pp. 647-665. Steve Culman, Greg LaBarge, "How much N has been lost this year?" available at: http://corn.osu.edu/newsletters/2015/2015-21/#2 (citing, John L. Havlin, Samuel L. Tinsdale, Werner L. Nelson, James D. Beaton, Soil Fertility and Fertilizers: An Introduction to Nutrient Management (8th ed., Prentice Hall 2014)). T.J. Logan, D.J. Eckert, D.G. Beak, "Tillage, crop and climatic effects of runoff and tile drainage losses of nitrate and four herbicides," Soil and Tillage Research, Vol. 30, Issue 1 (May 1994). Todd Royer, Mark B. David, and Lowell E. Gentry, "Timing of Riverine Export of Nitrate and Phosphorous from Agricultural Watersheds in Illinois: Implications for Reducing Nutrient Loading to the Mississippi River," Environ. Sci. & Technol., vol. 40, no. 30, pp. 4126-4131 (2006).